Bangalore residents didn’t really need data to know, but their biggest grouse is based in reality — their city indeed has the worst traffic in the country. Data collected by Ola through all of 2017 showed that their cabs in Bangalore moved at a measly average of 17.2 km per hour. This the lowest among major cities in India — cabs in Hyderabad moved at 18.5 km per hour, those in Chennai moved at 18.9 m per hour, those in Mumbai moved at 20.7 km per hour, and cabs in Delhi, perhaps because of its long freeways, moved at 25 km per hour. And things seem to be getting worse in Bangalore, which is already infamous for its bumper-to-bumper traffic — Ola cabs had moved at an average speed of 20.4 km per hour in 2016, but their average speed fell to 17.2 km per hour in 2017. It’s a problem that seems to be pervasive across India — for each of the 7 major cities for which Ola released numbers, traffic speeds fell from 2016 to 2017, including Delhi, which had even briefly implemented the odd-even rule. The fall was most pronounced in Hyderabad, where traffic speeds fell from 27.1 km per hour to 18.5 km per hour, perhaps thanks to the metro construction that had been taking place in many parts of the city. 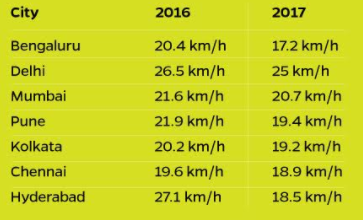 Overall, cabs moved 2.9 km per hour slower in 2017 than they did in 2016. That’s a trend that’ll worry everyday commuters and policymakers alike — gridlocked traffic is stressful for its unfortunate participants, and is a drain on productivity. And traffic comes in the way of helping cities become economic and startup hubs — if simply traveling across a city can take hours, it comes in the way of collaboration and innovation, with residents spending time stuck in cars and cabs, instead of actually coming up with ideas and solutions. And with Bangalore having the worst traffic in India, it doesn’t augur well for its status as India’s premier startup hub. Bangaloreans have long grumbled about the rapidly worsening traffic in their city, and Ola’s data only serves to confirm their worst fears. And Ola’s report doesn’t only say that Bangalore has the slowest moving traffic in India — it specifically singles out the much-derided Silk Board Junction as one of the most gridlocked places in the country. The jokes, it seems, had a ring of truth after all.